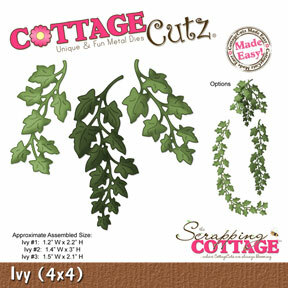 Hello everyone and Welcome To CottageCutz Inspiration Day! 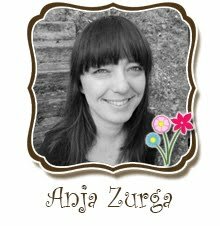 While everyday is an Inspirational Day here at the CottageCutz blog with all our talented CottageCutz Designers, we have decided to do a couple of Inspiration Days a month. 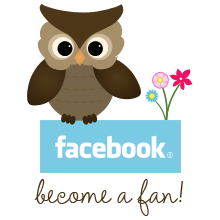 This will consist of 2 or more designers creations for you to view. Inspirational day, such fun and I’m really glad that I can do this together with Simona and Cheryl. I decided to use some dies from Vintage release, which is so special and so darling. 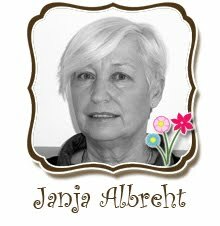 It brings you to Jane Austen time and everybody who knows me, knows how much I love and admire her work, indeed! So, this was my inspiration for my two cards. They say, that eyes are the mirror of our soul and this is the reason I put heart in my mirror. I think this is the great way to show your best friend how you admire her kindness and tenderness of her heart. 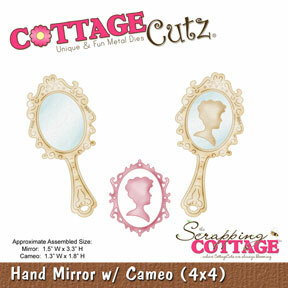 Mirror is cut from this great Hand Mirror and Cameo die and heart is made with Angel Wings Mini die. Always when I think about Jane Austen books, especially about her book Pride and Prejudice, I think about all the letters which they send it to each other. 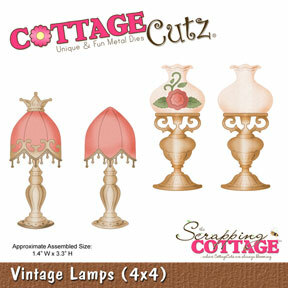 So, I made little old letter and put this beautiful romantic Vintage Lamp on it. 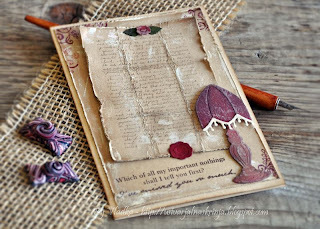 For a 'wax seal' I used bigger flower of the Vintage Lamps die and put the small one on the top of the letter. This is it for today! Have a nice day. 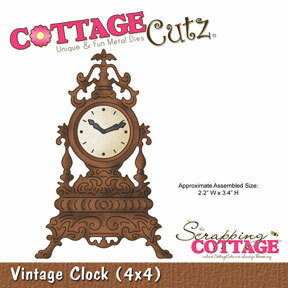 Hello everyone and Welcome to CottageCutz Inspirational Day! 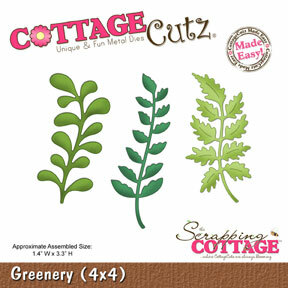 Today Vladka , I (Simona), & Cheryl are sharing new creations made with beautiful CottageCutz dies. 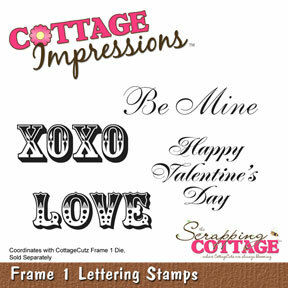 and Love Tags, set (4x6) dies and Cottage Impressions Frame 1 Lettering Clear Stamps (4 items). 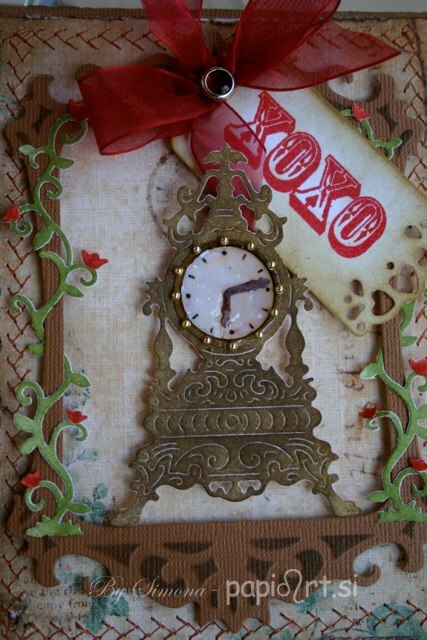 I used Distress Ink - walnut stain to color my clock. 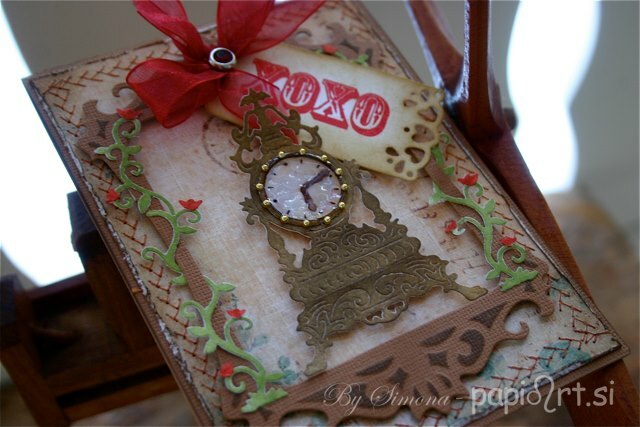 The face of the clock was colored with Copics and I added and heat embossed some clear UTEE. Around the clock face I added gold self adhesive plastic half beads. The vines were colored with Distress Ink - peeled paint and for the little flowers I used a red Copic marker. 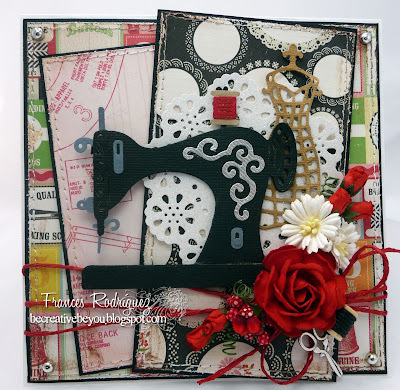 It's been a long time since I've last used my sewing machine to add some stitches to the card. I also distressed paper edges with distress tool. To finish the card I added one of the tags from Love Tags set, a red bow and a brad. 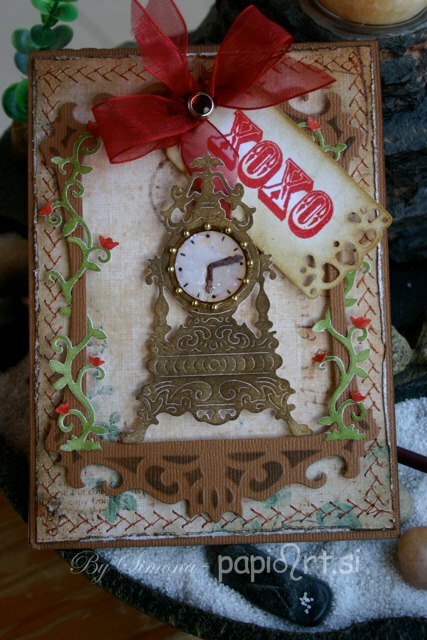 I stamped the word XOXO from the Frame 1 Lettering clear stamps and heat embossed it. My card was designed for SCS Sketch Challenge, that is where I got this layout from. I wanted to use some bright and cheery colors, and chose to go with this bright blue. 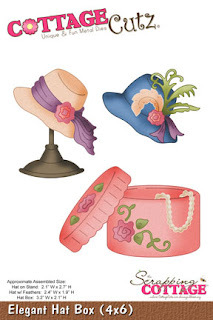 I airbrushed the hat box, and then colored the flowers,and leaves with copics. Next for the hat I colored it completely with copics. I did add some Viva Pearl Pen for the black and white.dots. The flower centers are flat back pearls. 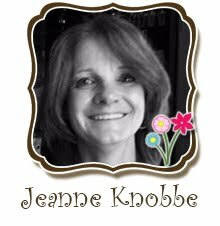 I thought it would be cute to add the flowers to buttons, and did that on all four. Thank you all for stopping by and hope you have enjoyed today's INSPIRATION! We will be back tomorrow for another INSPIRATION DAY! Hope you will come back and take a peek tomorrow!!! The doily is the CottageCutz Scalloped Doily. and some charms to finish the card. Hello Friends. 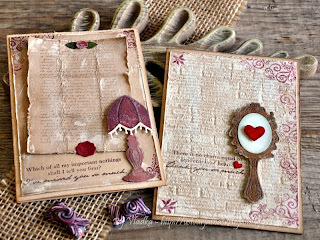 It's Carol here today to bring you a project just in time for your Valentine gift giving needs and it's made with something you normally would just throw away. It's an empty toilet paper roll! 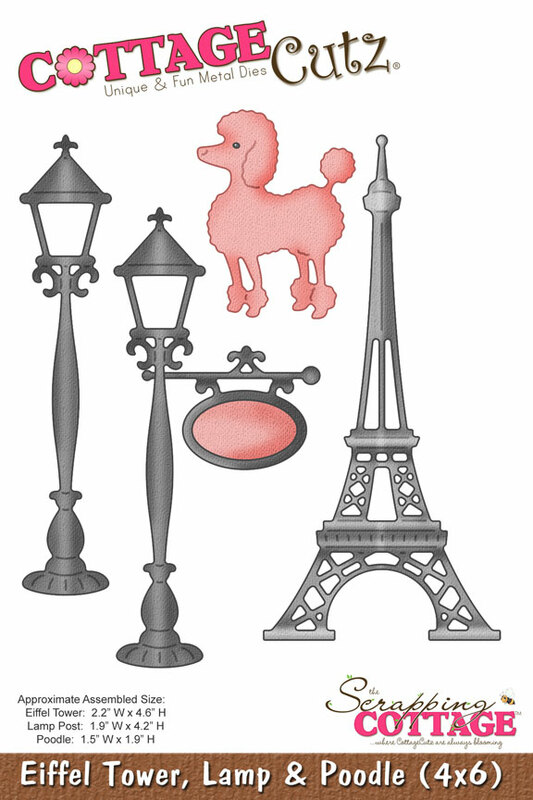 For this one the Eiffel Tower, Lamp, & Poodle Die was used. I lined the inside of the tp roll with black cardstock I stamped a piece of white cardstock with a Large French Script Stamp that I got at a yard sale for 50 cents. Upon inquiring about this stamp the best I can come up with is that it may have been a Stampin Up stamp but I am not sure. I then distressed with Brushed Corduroy Distress Ink and glued to the tp roll. The bottom was then hot glued together to form the holder. I used some trim that I bought a long time about that is beaded and had that fufu on it. 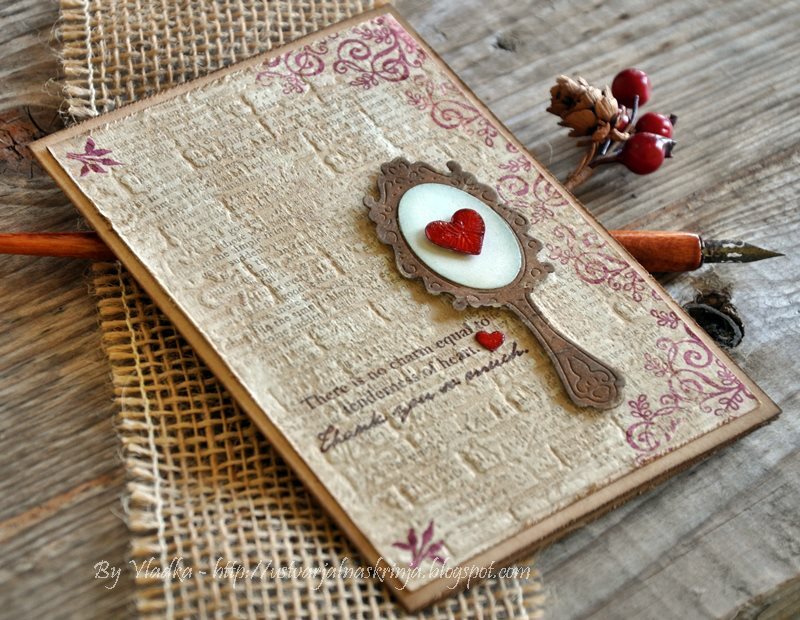 The heart is a Martha Stewart Punch that was glued to black cardstock. It was cut free hand so it would show up on the paper. 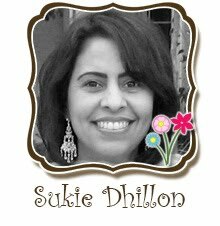 The heart on the Eiffel tower is a Recollection sticker, the flowers were in my stash. The pink rhinestone flourish is also from Recollection. Gathered lace was attached around the opening to dress it up and more eyelash yarn was glued at the top to compliment the bottom treatment. 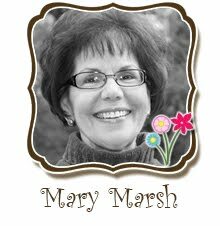 The handle was punched with Martha Stewarts Heart border and glued to each side. Little bows were made with ribbon and adhered to the top of the handles . This is ready to have some Hershey's Chocolate kisses placed inside! You know once you do one you can't just stop there! So here is another one I made using the CottageCutz Small Teacup Die and the CottageCutz Tea Time Doily. 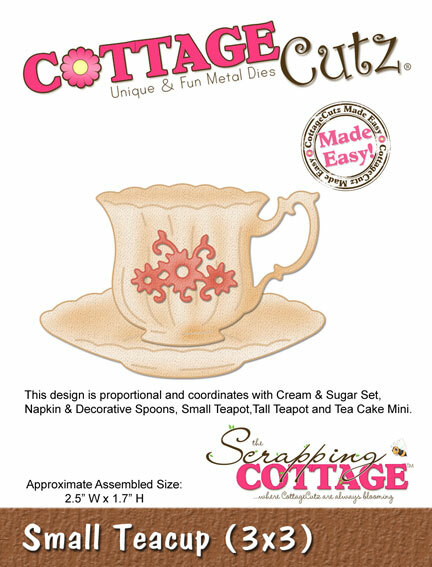 They are so addicting to make-just try it-you'll soon find out. They are so fun. This was made from various laces and Recollection trim and flourish pearls. The sentiment was created in word and cut with a heart shape die with pearls applied around the edge. The doily was folded over about 3/4's and glued to the tp roll. Thanks for stopping by today. Hello everyone, today I'm sharing the Inside Cover page of my album. 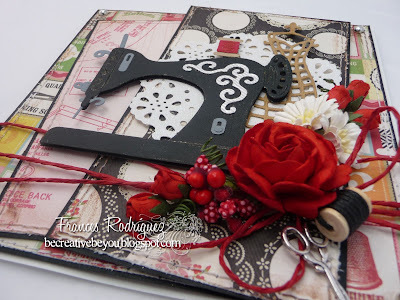 I love the way this one turned out, I used several CottageCutz Dies on this page. and used different techniques. 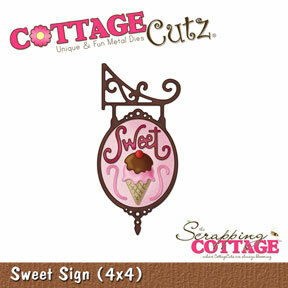 So for my CottageCutz Sweet Sign I used CIP's Black Embossing powder to make the sign shinny , and I LOVE the look it gave it. I also did the SWEET in heat embossing as well. Next for the CottageCutz Mini Dress Form I used Flower Soft on the top and then colored the bottom green to make it look like a flower tree outside of the house. 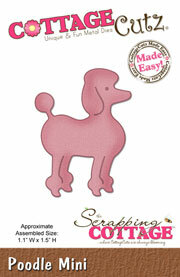 For the MINI POODLE I dusted her in pink and black distress inks, and then did a clear embossing powder over her. HOUSE- is CottageCutz CottageVille /Santa's Retreat. 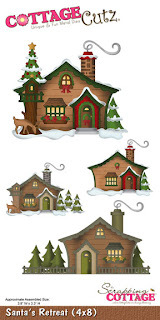 LOVE that you can use these all year round, and make them anything you want. I made my a Shabby Chic Cottage!! 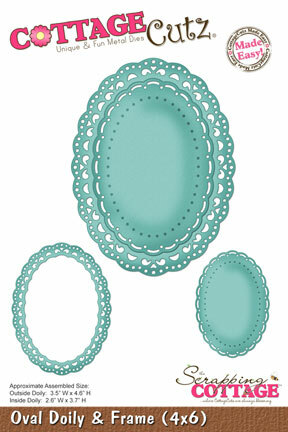 of the layers are the CottageCutz Oval Doily & Frame , cut and layered. Its nice to be able to use this die in a different way. Hello everyone! Today my card features the CottageCutz Elegant Purses Die and the CottageCutz Pumps mini die as the focal image. I cut the purse from patterned paper and inked the edges with distress ink, Vintage Photo by Tim Holtz. I cut the pumps from white cardstock and colored them with Copics. They were also distressed slightly with Vintage Photo distress ink. 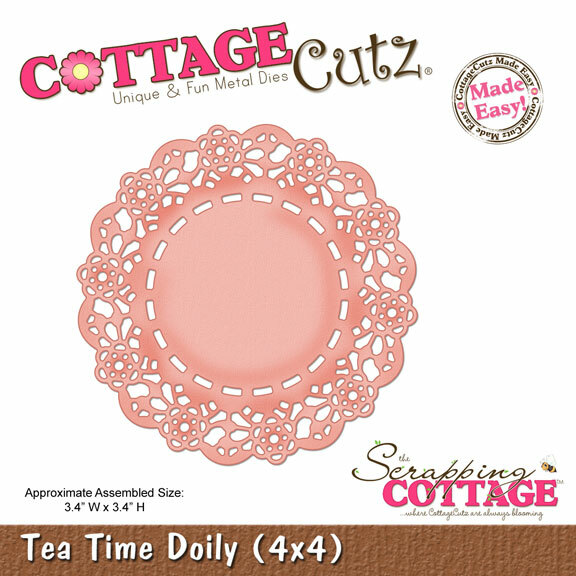 The doily is the CottageCutz Scalloped Doily. I added some vintage style lace and a crocheted flower to finish the card. 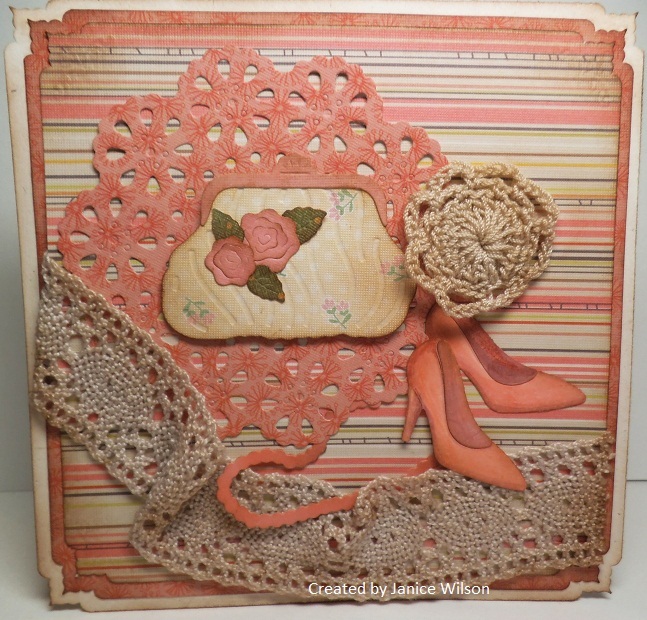 I added distress ink to the lace and crocheted flower as well. Enjoy the day! This is Olena. Today is my third post as designer! I wanted to share my NEW LOVE card. 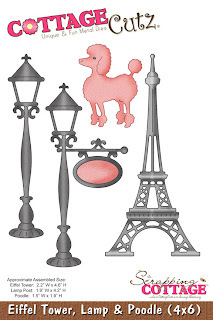 I made this card using the Super CUTE CottageCutz - Eiffel Tower, Lamp & Poodle dies from NEW 2013 Vintage Collection. 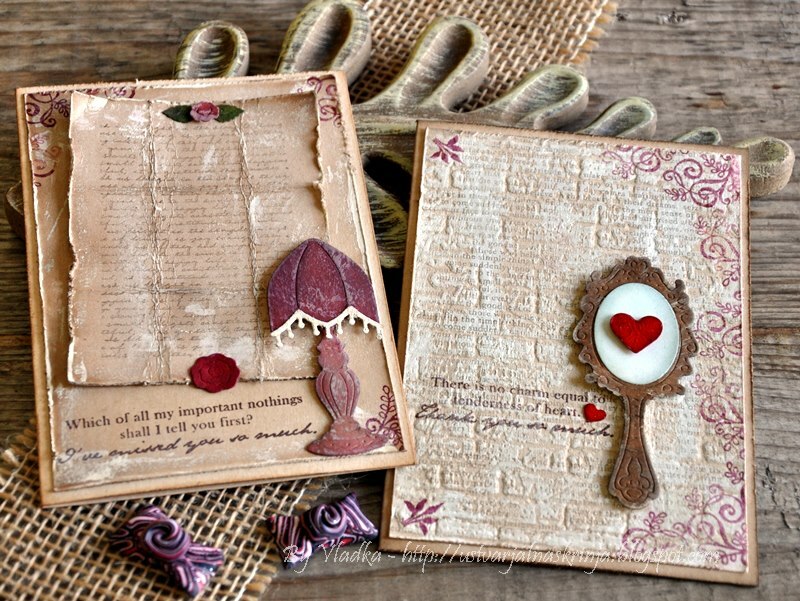 There are so many beautiful dies included in the new collection. I cut the lamp in grey cardstock and sponged the edges with craft ink. I put under the lamplights a piece of yellow paper to showing brighter color of this part. Then I cut two times a cute dog in cream paper and sponge the edges with brown craft ink. I ,also, added nose and eyes for dogs using black craft marker. I some try to reversed the one, so they would be facing each other. 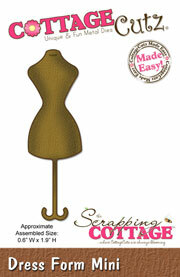 I added all die cuts to card front as shown in picture above. 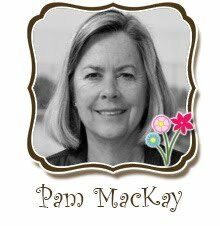 Then, I decorated card with clear Dew Drops, paper hearts and pearls. Hello everyone, today I'm sharing Page 6 of my mini. 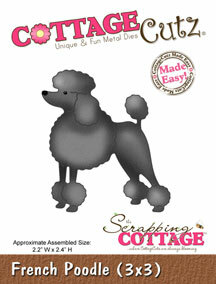 On this page I used the 3 x 3 CottageCutz French Poodle and reversed the one, so they would be facing each other. I thought it would be super CUTE to have them like this. 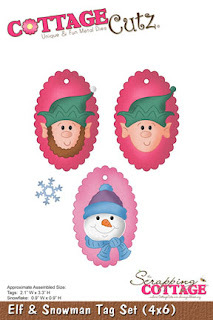 The oval tags that you see in the small pocket on front are from CottageCutz Elf & Snowman Tag set 4 x 6. Perfect for this mini page. I LOVE the tags as they are perfect all year round. Now there is a LOT Of room for PHOTO's here. there are 5 spots on this inside flaps. Also you can have writing as well. There is a Pull out tag on the right side and room for 2 more photo's on it. Thank you all for looking and for your wonderful comments!! !